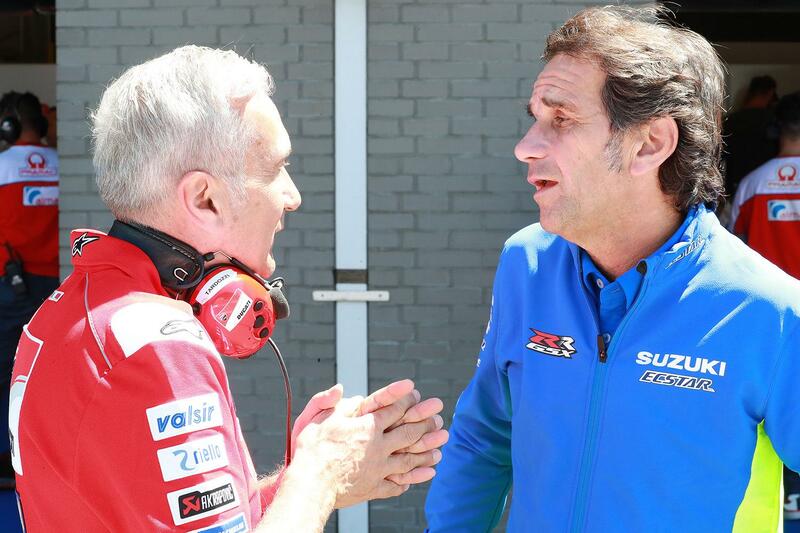 Suzuki MotoGP boss Davide Brivio has told MCN exclusively that he hopes that the process of lodging an appeal against Ducati’s new under-bike spoiler after the Qatar Grand Prix will be good for the future of the championship. Joining Aprilia, KTM and Honda in filing a protest only settled in favour of Ducati yesterday by the FIM Court of Appeals, Brivio says that despite being defeated in court he’s happy with the outcome. Coming after Ducati fitted the new part to Andrea Dovizioso’s bike before he snatched a last-corner victory from Marc Marquez at the first race of the year, Brivio told MCN when we bumped into him in Buenos Aires airport en route to this weekend’s Argentine Grand Prix that much of the debate around the spoiler came from what it’s purpose was. “I think at the end that the situation we ended up in was more of a legal situation about the wording rather than judging the technical part itself. What has happened is that it’s clear that the part generates downforce. That’s been proven by our calculations, from all four manufacturers, and during the hearing even Ducati said that. But according to the regulations it depends on the intention you have, and they said that their intention was to cool the tyre and not to take advantage of the downforce. However, while the matter might have been settled in court, Brivio believes there will be one further outcome of the decision. Joining his fellow team bosses in launching comprehensive studies into the nature of Ducati’s part (including computational fluid dynamics studies) he says that it won’t be long until the others follow suit.